The concept of cheek augmentation, regardless of the method used, is really referring to an external facial contour zone. While it is true that it largely refers to augmenting the bone that lies underneath it (or the soft tissue that lies above the bone when fillers or fat is used), this is not always exclusively true. This is evident in the submalar or malar shell style cheek implant where some of the implant augments the soft tissue below the main body of the zygomatic bone. The one area of the cheek that no standard implant is capable of augmenting is the zygomatic arch or the posterior tail of the cheek. This is a well recognized zone of the cheek and is what constitutes a significant part of the high cheekbone or model cheek line. This creates a line of visible prominence that extends back almost the whole way to the ear. In some ways it almost parallels that of the jawline from a midfacial perspective. While an arch component is most commonly a posterior extension of a cheek implant (usually custom made), it can also be done as an isolated form of cheek augmentation. It is indicated when one wants a more defined arch width but is otherwise satisfied with their anterior cheek projection. 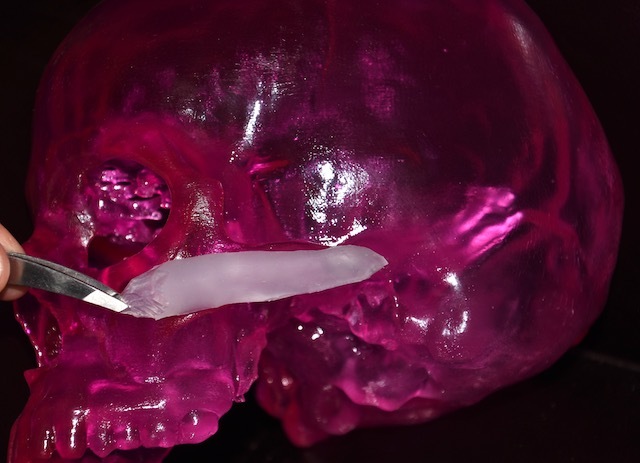 Since no such performed zygomatic arch implant exists, it can either be custom made from a 3D CT scan or hand carved from a solid silicone block. In making such an implant during surgery, the length is established by preoperative measurements between the lateral orbital rim back to just in front of the ear. This is usually in the range of 5 to 5.5cms. Its height should not be that of a ‘skinny stick’. It needs to be much tatter than the bone in the range of 7 to 8mms. How wide it should be will depend on how prominent the patient wants but 5 to 7mms is more than adequate for most patients. 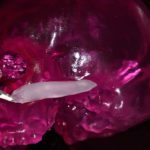 zygomatic arch implant carving dr barry eppley IndianapolisThis short video demonstrates some of the hand carving needed to make a zygomatic arch implant out of a solid silicone block. Through an intraoral approach subperiosteal dissection is carried back along the entire length of the zygomatic arch. Since most zygomatic arches are curved it is easy if one is careful to end up off the bone during the dissection of the posterior half of the arch. Because it is not possible to screw in zygomatic arch implants the limited pocket dissection must ensure its stability. To add to that stability I will place two 4mm wide perfusion holes through the anterior end of the implant to allow for tissue ingrowth. Zygomatic arch implants add a line of skeletal enhancement that horizontally cuts across the midface, creating a more defined facial shape. They can be placed intramurally and, because of their straight line shape, are the most straightforward of all midfacial implants to create by hand.